Scott is joined by actor Steven Walters, who plays the part of Prince Hal in a production of Shakespeare’s Henry IV Parts 1 and 2, on-stage at the Dallas Theater Center, to talk about the performance, its three “knightly” characters (Hotspur, Falstaff and Hal) and what we can learn about modern chivalry from William Shakespeare. Plus: Christopher Burns gives chivalry a workout in his Fight Like A Knight exercise program, and we hear some “lines of chivalry” from our listeners. Learn more about the Fight Like A Knight fitness and training program. Our listeners step up with a great selection of lines of chivalry in our Listener Challenge. You can take the Listener Challenge by suggesting your own line of chivalry for the November podcast. All entries will be entered into a drawing for a copy of the book Swords, An Artist’s Devotion by illustrator Ben Boos. Actor Steven Walters plays Prince Hal in the Dallas Theater Company’s Henry IV. A new production of Henry IV, Parts 1 and 2, staged at the Dallas Theater Center is garnering rave reviews — and giving audiences a new and exciting look at what may be Shakespeare’s most chivalric work. 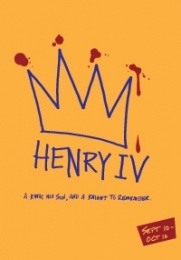 The play features an intriguing trio of knightly characters, Henry “Hotspur” Percy, Sir John Falstaff, and Prince Hal, and each of them has a very different take on the notion of knighthood and chivalry. Actor Steven Walters, who plays Prince Hal, talks about the history of this play, his role and his own view of chivalry from the stage of Shakespeare. Listen to an interview with Prof. Kathryne McDorman and director Kevin Moriarty on KERA’s Think talk show. Fight choreographer and martial arts enthusiast Christopher Burns talks about his Fight Like A Knight workout/training program. Mr. Burns’ program calls upon his experience as a martial arts practitioner, film director, fight choreographer and kinesthetic analyst to provide students with a grounding in practical sword-fighting technique and a rigorous “high intensity, low impact” full-body workout. Classes are held regularly in Southern California; information and Christopher’s blog can be found at the program website.